I have a handful of recipes I consider the world’s greatest casseroles. They’re special, old-fashioned, dishes that cook slowly, are better the next day and need to be made in quantity. They’re the dishes to share with friends, to use for several meals and to store part in the freezer for weeks later. They’re the dishes we remember from our past but seldom see anymore. They’re the flavors from a Greek taverna, a country French bistro, a Mexican market stall, an Indian friend’s kitchen, or a grandmother’s table. They’re the culinary treasures we must not lose like Moussaka, Lamb Korma, Cassoulet, Chicken Mole and Cabbage Rolls—to name a few. When winter’s chill invites us to share warm, stewy suppers, February’s a good time for cabbage rolls. As with many of these recipes, here’s a way to stretch a little meat a long way, filling in the spaces with lots of good-for-us vegetables. Two pounds of ground meat along with two cabbages, onions, carrots, tomatoes and herbs will make a lavish meal for 10. The only part of the preparation that demands patience is peeling the leaves from the cabbage. Once the cabbage leaves are ready, it’s just a matter of mixing up the meat filling, rolling the burrito-shaped packages and braising them slowly over a bed of aromatic vegetables later turned into a savory paprika gravy. Cook the rice in 6 fl. oz. water (3/4 cup) until all water is absorbed. Cool. Heat 2 tablespoons oil in small skillet and sweat chopped onion, covered with butter paper wrappers until tender. Add garlic and sauté until garlic is cooked. Onion and garlic should not brown. Cool. Add parsley. Remove cabbage leaves for stuffing by steaming cabbage in a large pot of simmering water. While one cabbage is steaming for a few minutes, peel two or three leaves from the other cabbage and slice down the core. Repeat, successively steaming and peeling back the cabbages alternately until you have 30–34 nice sized leaves. Add extra water to the pot, bring to a boil with salt and blanch the leaves 6 at a time until wilted enough to roll. V-out the thick part of the center rib of each leaf. Reserve ribs to slice and add to braising base. Stack leaves. Render fat from bacon or heat oil; add chopped onion, carrot. Sweat to soften; add garlic, paprika, red pepper, marjoram and sauté until fragrant. Add tomatoes, reserved sliced cabbage ribs, salt and bring to a simmer. Pour the braising base into a large covered enameled steel or cast-iron casserole or use two glass baking dishes that can be covered with foil. Arrange cabbage rolls snugly on top of flavoring base. Cover first with butter wrappers and then top with lids or foil. Bake at 300° (for glass) or 325° for metal or ceramic for 2–2 ½ hours. When cool enough to handle, gently remove cooked cabbage rolls from base. Complete sauce, by combining the base with 3 cups thin chicken gravy (3 cups stock slightly thickened with 1 ½ oz. [3 tablespoons] roux). Simmer all together and correct seasonings, adding more salt if needed and juice of half a lemon. Whisk in ½ cup cream or sour cream. 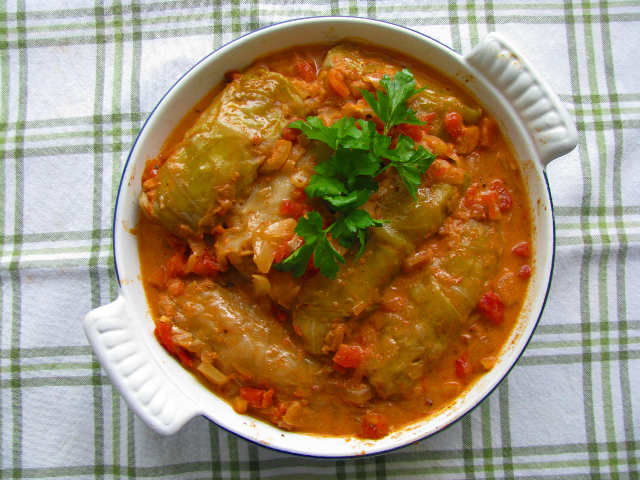 Reheat cabbage rolls in the paprika sauce and serve with boiled potatoes, noodles or crusty bread. Over the years my family has expected iced, heart-shaped butter cookies for Valentine’s Day. I baked these treats for children’s parties, sent trays to grade school, packed them for college and shipped them to young professionals in distant cities. This recipe originated from the Joy of Cooking’s Sand Tarts, and I find it the best tasting, easiest to handle cut-out cookie dough. I’ve tried dozens of sugar cookie recipes, but when it comes to Valentine cookies, I always return to these. The dough rolls like a sheet of fabric. It needs very little dusting flour and lifts easily onto baking trays. It cooks to a golden, delicate crispness and delivers excellent butter cookie flavor laced with pure vanilla and a touch of lemon. There’s no baking powder in the dough, giving the cookies a character reminiscent of sweet, rolled shortbread. My family insists on iced cookies. The egg-white-brushed surface bakes to a sheen that smoothly takes the frosting. The cookies may also be sprinkled with granulated or colored sugar before baking for a simpler effect. Piped edges, swirls or messages will harden best, using royal icing. *If you squeeze juice from lemons that have not been first grated, freeze rinds in a plastic bag. Grate off frozen zest as needed. Grate lemon rind into mixing bowl. Add sugar and rub with fingertips to flavor sugar. Remove lemon sugar to smaller bowl. Slice butter into mixing bowl and beat until creamy with wooden spoon (if butter is too firm, soften slightly in microwave). Gradually add sugar creaming until fluffy. Blend in salt, vanilla, egg and egg yolk. Beat well. Gradually mix in flour, stirring to combine thoroughly. Use your hand and a rubber scraper for the final blending. Knead dough lightly. Shape dough into block, wrap in plastic and chill several hours or overnight. Preheat oven to 350°. Unwrap chilled dough block and slice into four even segments. Roll one portion at a time, first knocking the dough on both sides with a rolling pin to soften slightly. Using swift back-and-forth rolling motions, continue to roll dough into an even circle 1/8th inch thick. Add bits of dusting flour as needed to keep the dough from sticking to counter and pin. 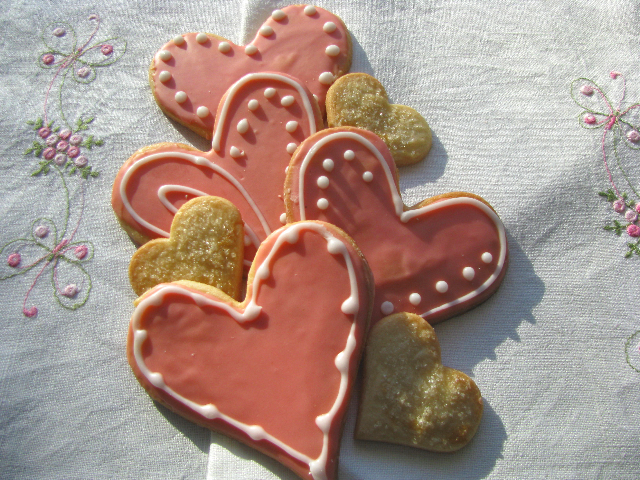 Stamp out heart shapes with assorted cutters and lift cookies onto parchment-lined baking sheets. Fork-whisk reserved egg white in shallow bowl and lightly brush over cut-out cookies. Bake in preheated oven 10–14 minutes depending on size and desired state of browning. Cool on wire racks. Ice when cool. Makes 30 3 ½-inch hearts plus 12–14 smaller hearts. Stir the vanilla, salt and coloring into warm milk or cream before adding to sifted confectioners sugar. Icing needs to be on the thin side to spread smoothly. Allow icing to harden before adding trim. Whisk egg white with lemon juice to combine. Add sifted powdered sugar to piping consistency. Blizzard warnings sent us out for groceries before the winds began. The vegetable bins looked bleak. Winter freezes had set back Florida crops until broccoli and green beans cost as much as fancy mushrooms. At the end of the produce aisle waited perfect heads of green, white and purple cabbage. Winter’s a great time to cook cabbage; it’s loaded with vitamin C, antioxidants, fiber, and suits any cooking style from salads to side vegetables to the classic stuffed cabbage. As we prepare to wait out the storm, we’ll feast. 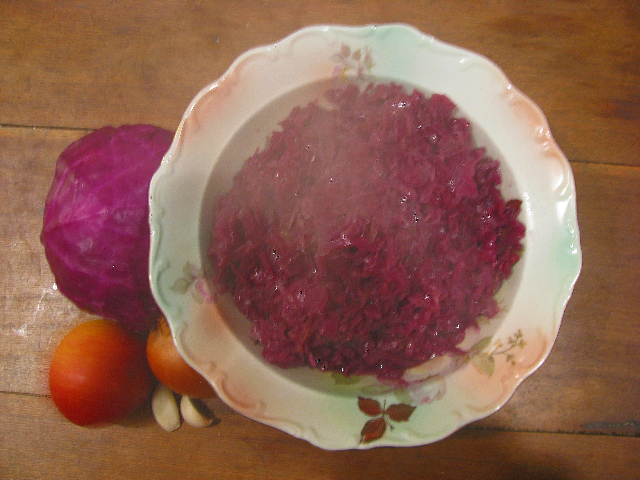 The ruby-purple red cabbage needs acid to hold its color as it cooks. Vinegar is the choice of tradition and the addition of a little onion plus a tart apple takes us to the north European winter cuisine of Alsace, Germany and Scandinavia. I roast the last frozen farm chicken with small potatoes and onions, while a sweet-tart red cabbage simmers on the stovetop. We sit down in candlelit darkness as swirling snow drifts into mountains beyond our window. While steam wafts from the fragrant cabbage, we lift our glasses hoping for calm through the night. Toss the shredded cabbage with vinegar in a large bowl. Heat the fat or oil in a heavy stainless steel or enameled iron stewing pot and gently sauté the onion until limp. Add the chopped apple, garlic and continue to sauté until garlic is fragrant. Mix in the cabbage, one handful at a time. Sprinkle with brown sugar, salt and water. Cover and cook over moderate heat until cabbage wilts. Stir occasionally, reduce heat to simmer for 30–40 minutes or until cabbage is tender. Taste for seasoning adding more salt or vinegar if needed. Serves 4 and is even better reheated after cooling. You are currently browsing the Mary Jo's Kitchen blog archives for February, 2011.